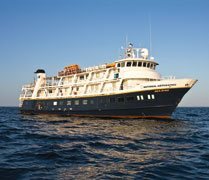 Since 1979, Lindblad Expeditions has provided an alternative way to explore the world. Although each journey is different, there are some elements that are common to all of them: Our journeys are designed to take you to places of natural beauty and compelling history, avoiding crowded tourist stops. While your journey may be adventurous, our travelers enjoy comfortable accommodations, fine food and service. An enthusiastic staff of naturalists and historians is on hand to share their knowledge and inspire you. You'll experience the sheer joy of traveling to new, exciting places with a small group of like-minded people, in an informal atmosphere. While there's a plan, we're always willing to change it so that you won't miss spontaneous events along the way.